In today’s market there are two types of prefinished hardwood flooring – solid and engineered. During installation each of them has its advantages, but perhaps they have some common problems faced by the floor installers which we will consider in this article. To begin, I want to remind you that prefinished hardwood flooring is covered with several layers of varnish directly in the plant where it is made. To diversify the range of colors, many types of wood are covered with a special paint, called stain. And to give product a finished look, painted hardwood is covered by layers of varnish. But when you open a fourth or even tenth box you see that the shade of prefinished hardwood flooring from this box does not match the shade of the boards that are already installed! The difference is visible and very strong. The manufacturer. In this situation, the manufacturer does not have anything to do with the fact that his material is mixed in the store and on this oversight is necessary to ask the seller. The seller sees no guilt, because he was selling the remains of the material, offering a lower price, but the client is not asked about the cause of the sale. And the seller’s right! Customer? The customer is always right, especially in this situation. He is a regular man, and never engaged in hardwood installation. How could he know that the material could be from different parties, the manufacturer? Well, if the manufacturer does not blame, the seller – also, and the customer is always right so, then who is? That’s right! 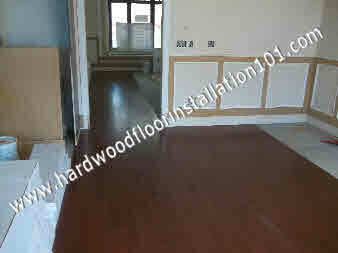 Floor installer! 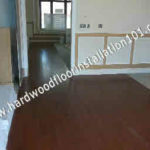 It is the duty of floor installer before installation to check not only color, but the batch numbers of prefinished hardwood flooring in all the boxes. If this floor installer’s mistake, all expenses for it he will pay himself. As soon as you notice the different numbers on the packages, report it immediately to the customer even before you open them. Make an advice to the customer to return the product back to the store or exchange it for another as soon as possible. What if the product can not return or exchange and you must install it as is? Open several boxes with different shades and mix pieces of wood during installation. Even in this situation you can make the customer happy. How? Sometimes, prefinished hardwood flooring, installed from two different parties, looks very exotic. If you noticed it, tell the client that the problem has become a virtue, and his excitement about buying the wrong material disappear immediately. For more important tips on prefinished hardwood flooring and its installation read our other articles and posts.